The Globe of Science and Innovation will be closed to the public from 4 May until the end of March 2016 for large-scale maintenance work. The renovation project, which is set to last about ten months, aims to overhaul the general building infrastructure and, above all, to replace a number of ageing components. 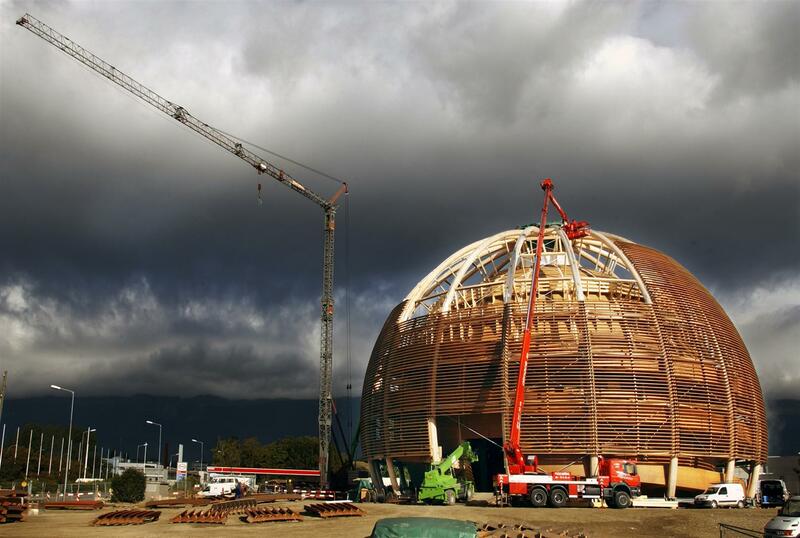 The Globe, during its assembly at CERN in 2004. Originally designed by Genevan architects Thomas Büchi and Hervé Dessimoz for the Swiss national “Expo 2002” exhibition in Neuchâtel, the Globe of Science and Innovation quickly became a symbol of CERN. In 2004, when it was relocated to its present site, the Globe acted as the venue hosting official delegations at the Laboratory’s 50th anniversary celebrations. Ten years on, thanks especially to the permanent exhibition Universe of Particles, the Globe has become THE venue for meetings and interactions between CERN and the general public, and is destined to continue in that vein for many years to come. For this to happen, the structure needs something of a facelift. The manager of the Globe, Bernard Pellequer, explains: “As we all know, the building’s structure is made of wood, an organic material that, unfortunately, has a limited lifetime. After more than ten years’ faithful service, certain components that were initially designed to last only for the months of the Neuchâtel exhibition need to be replaced if the Globe’s own lifetime is to be extended.” The eighteen outer cylindrical arcs, each measuring 32 metres in length, will all need to be replaced by new ones of identical appearance but made from a hardier type of wood. In addition to the replacement of the cylindrical arcs, the work will focus on renovating the external ramps, the disabled access facilities, the staircases and the lighting system. “This is all part of a long-term maintenance plan," says Bernard Pellequer. “When the Globe reopens in the first half of 2016, we will be all set to host cultural events, lectures and exhibitions for decades to come!" *The 18 cylindrical arcs will be taken down and cut up in situ in order to be recycled.